Select first the imaging method. You can choose between methods A-D by activating the appropriate radio button. If you wish to use ratios for chemical imaging you have to additionally select the 'ratio' button and the method in the denominator (methods E-G). Next, type the wavenumber values P1-P6 used as integration borders, or frequency points for construction baselines. Note that the number of values depends on the integration method. Select the data block on which chemical imaging should be carried out. The following data blocks can be used for chemical imaging: original data (i), preprocessed data (ii), derivatives (iii), and 3D-FSD data (iv). Pressing the 'plot' button calculates the respective parameters from the selected spectral data block and plots these parameters as a function of (x,y) position within the map. Button 'cancel': The window for chemical imaging is closed. Whereas the original data will be displayed in the upper right panel of the main window, chemical images re-assembled from preprocessed, derivatives, and 3D-deconvolution data are given in the lower right panel. 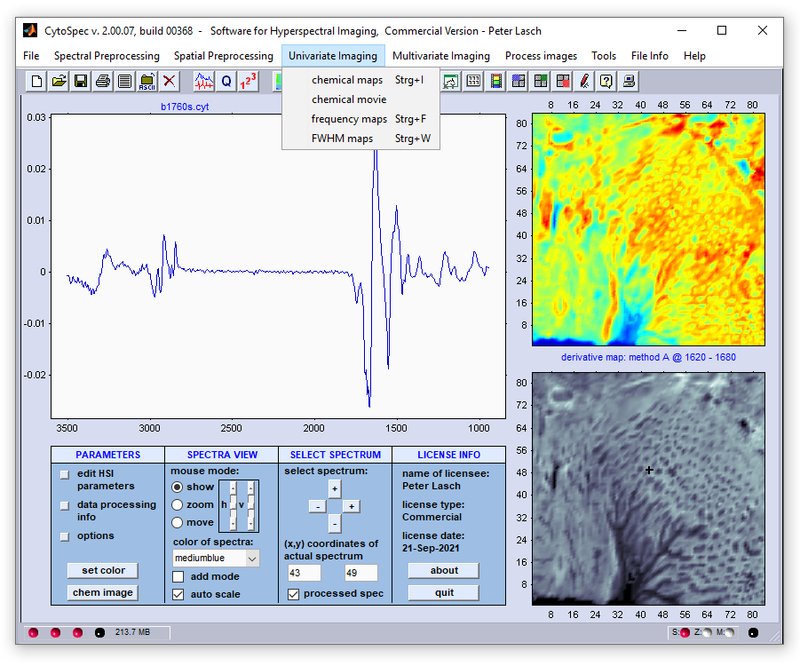 Hyperspectral maps produced from multivariate imaging approaches (cluster, PCA, or ANN analysis) are also displayed in the lower right panel of the main window. How to save spectral images as bitmaps? How to export the map data (absorbance/transmittance/Raman intensities) as ASCII-tables? The function 'chemical movie' can be used to play an animation of chemical images, or frequency slices. With this function the system automatically steps through a range of frequency values, facilitating judgement of the spatial distribution patterns of individual spectral modes. Chemical images are generated by using option 'B' of the function chemical imaging. act wvn pos: the (rounded) frequency position of the actual chemical image in wavenumber units. increment [in wvs]: This allows to modify the the step size, in wavenumber unit steps (wvs), between frequency slices. If a value of '1' is indicated the step size of the animation will be 1 * 'wvs', with wvs being the wavenumber step (the point spacing between two frequency slices, see WVS - wavenumber step). The default value for 'increment' is '4'. Frequency imaging: This function permits visualization of peak positions, and their variations, within hyperspectral maps. Band positions - either maxima or minima - are obtained and plotted as a function of the spatial coordinates. Band positions can be obtained from all types of data blocks, including also derivative spectra (for details refer to chapter Internal Data Organization). Two different methods of the 'frequency map' routine are available: Peak maxima/minima can be obtained from spectra contained in one of the four data blocks, or for overlapping bands from second derivative data blocks (this may also be second derivatives from spectra of the derivative data block!). The use of second derivatives for peak picking may be useful for the detection of peaks in the presence of strongly overlapping signals, i.e. when the band is only a small shoulder on a strong signal. To some extent 2nd derivatives compensate also for baseline effects. Derivatives should be used with care as noise is considerably amplified. 1. Spectra of the data block of your choice (see option 'use data block') are interpolated. For interpolation, the spline method is used. Interpolation is carried out in the frequency range indicated in the edit fields 'select spectral region for peak search'. Furthermore, a factor of interpolation can be selected. This factor indicates how many times the number of data points will be increased by interpolation (only in the spectral region selected for peak picking). 2. If the option 'search maxima' was checked, the algorithm is then searching for the x-positions (frequencies) of the maxima within the spectral region indicated by the user. If minima are chosen, the program is searching for minima. IMPORTANT: If band positions are obtained from the data block of derivate spectra, maxima appear in second derivative spectra as minima and vice versa. There is no check for i) the order of the derivative and consequently ii), no compensation for the inversion of maxima and minima! 3. The frequency values of the maxima/minima are color scaled and plotted as a function of the spatial coordinates. If you wish to further analyze the band positions by other programs you can access the data matrix of frequency values by using the Export Maps function. 1. Second derivative spectra from the data block of your choice (see option 'use data block') are calculated by applying the Savitzky-Golay algorithm with 5 smoothing points (see also chapter Calculation of Derivative Spectra). 2. Derivative spectra are interpolated. For interpolation, the spline method is used. Interpolation is carried out in the frequency range indicated in the edit fields 'select spectral region for peak search'. Furthermore, a factor of interpolation can be selected. This factor indicates how many times the number of data points will be increased upon interpolation in the spectral region selected for peak picking. 3. If the option 'search maxima' was checked, the algorithm is then searching for the x-positions (frequencies) of the maxima within the spectral region indicated by the user. If minima are chosen, the program is searching for minima. IMPORTANT: If band positions are obtained from the data block of derivate spectra, maxima appear in second derivative spectra as minima and vice versa. There is no check for i) the order of the derivative and consequently ii) no compensation for the inversion of maxima and minima! 4. The frequency values of the maxima/minima are color scaled and plotted as a function of the spatial coordinates. If you wish to further analyze the band positions by other programs you can access the data matrix of frequency values by using the Export Maps function. search maxima or minima: indicate whether you want to search for peak maxima or minima. obtain peak positions from derivatives: if this checkbox is checked, second derivatives of the chosen data block will be calculated. In this case, maxima or minima will be obtained from second derivate spectra. Otherwise (if box is NOT checked), peak positions are obtained directly from the data block chosen. interpolation factor: this factor indicates how many times the number of data points will be increased by interpolation. select spectral region for peak search: the spectral region which will be used for peak picking. use data block: please choose the appropriate data block on which peak picking should be carried out. cancel: the 'frequency plot' window will be closed. FWHM imaging: This is a new function of CytoSpec version 2.00.05 (Feb 2018). Suitable to create pseudo-color images based on the full width at half maximum (FWHM) of vibrational bands. The function requires the presence of a band in a given spectral interval, ideally in all spectra. interpolation factor: this factor indicates how many times the number of data points will be increased by interpolation. Interpolation is performed in the spectral region indicated and is helpful to improve the numerical accuracy when calculating the fwhm values. select spectral region for peak search: indicate the spectral region in wavenumber units to be used for determining FWHM values of a specific band. use data block: please choose the data block to be analyzed. cancel: closes the 'fwhm imaging' window.